Share Name ID changes or updates can't be completed if you currently have another account change pending. other carriers may not support it. 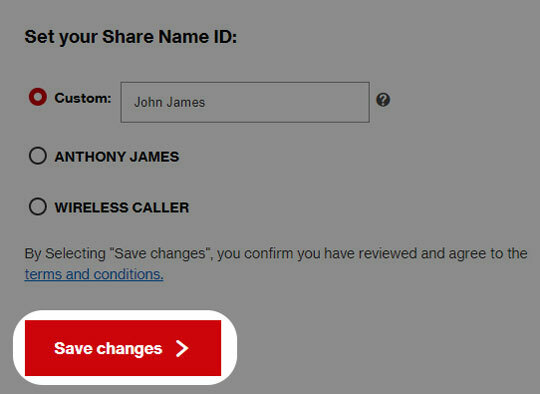 if the phone number is already programmed into the call recipient's phone with a name, Share Name ID cannot override that name to display what was programmed on My Verizon. If the Share Name ID isn't showing up correctly the person receiving the call may need to contact their service provider for additional support. Compartir nombre de ID info displays when calling another carrier which is using the service. Contact list of the device overrides the Share Name ID info when a call is received. Share Name ID can only be managed by Account Owner or Account Manager lines. Add the Share Name ID add-on if necessary. In the Share Name ID section, click Manage Share Name ID. The request can take up to 24 hours to process. Custom: Enter a name (up to 15 characters). Billing Party Name: The name that is on the Verizon Wireless account for that mobile number is displayed. WIRELESS CALLER: Displays the 10-digit mobile number. Choose a name to be displayed when a call is placed. From a Home screen tap the My Verizon app or navigate: Apps > My Verizon. Oprime el ícono Menu (upper-left) then tap Devices (may require scrolling down). Tap Manage (below the mobile number). From the Manage tab, tap Edit Share Name ID. If prompted, enter the My Verizon password then tap Sign in. Edit the Share Name ID. To continue, review the Terms and Conditions then tap the Terms and Conditions checkbox.